Valve boss Gabe Newell just got done with his keynote address at this year's Design Innovate Communicate Entertain conference in Vegas. It was great! Here are the highlights. - He says some great sutff about combating piracy. Really seems to hit the nail on the head when it comes to the PC market. He says that people aren't pirating because they're cheapskates, they're pirating because it's a better service. No regional delays, no DRM, instant downloading, that kind of thing. Which Steam is aiming to match. They're not trying to stamp out piracy, they're trying to catch up. - Steam sales don't increase sales. "Increase" is doing the benefit a disservice. Team Fortress 2 sales go up by over 100% when there's a free update on the PC. And the recent Left 4 Dead sale? That saw sales of the game increase by 3000%. And no, that's not a typo. - The benefits of Steam as a retail platform don't stop there. Newell also mentioned that for a particular third-party game (which goes unnamed), sales went up 36,000% following a weekend sale. Sure, that's a hand-picked statistic (it's just one game, and we don't know how low sales were beforehand), but it's also an enormous figure. 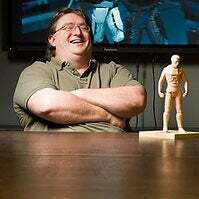 - Responding to audience questions, Newell believes that it's inevitable that a service like Steam - which started on the PC - will eventually migrate to consoles.